It's not the first time someone has said this to us. 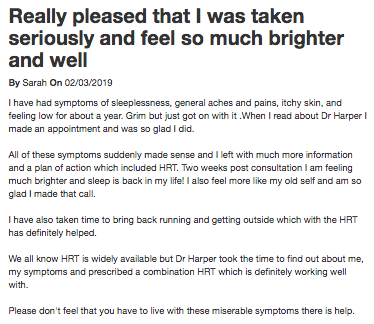 Our response: it is even more important, if anything, that we provide an environment where people feel comfortable writing a review, especially in areas where they may not even feel comfortable asking their best friend or closest relative for a recommendation. 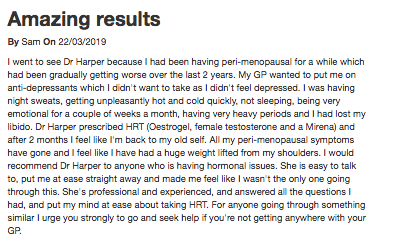 In the following example we are going to show you some reviews, written both on our client's website and on Google, by women about their experience of their women's health clinic. That review management is just as important for this kind of business, perhaps even more so. And within that review management our moderation system (many of you will know it as Resolution™) is crucially important. It is undesirable that people read factual inaccuracies in reviews of estate agents and insurance brokers - both for the business and for their potential customer - but how much more important that reviews like those shown above are not simply published ad lib, without first being checked for veracity?